Our country is supposed to be one of the few countries, which is blessed with abundant solar energy. There is a tremendous scope for the growth for the Indian Solar Market. However, two factors which affect the same growth according to us are, lack of proper knowledge about the solar power technology amongst the consumers and penetration of ‘not so good’ quality products in the market. Hence, we at Bijli Bachao, thought of starting a series of articles where we will be trying our best to explore various concepts about solar power technology and help the consumers make an informed choice of good quality products. To start with, lets first have an overview about solar photovoltaic systems. Kindly have a look at this video for better understanding of the same. In this article, we will be focusing on solar photovoltaic (PV) panels. To explain in one line: Photovoltaic is the conversion of light (photons) into electricity (volt). For all those curious minds that wish to know how this actually works, we have included a video from YouTube to help you understand the process in a better way. In India, the most commonly available panels are polycrystalline/ multi-crystalline. Now, before we have a look at what factors will differentiate solar PV panels based on quality, let us first analyze what factors affect the performance of solar panels based on Indian conditions. 1 Direction For panels that have fixed position without any sun tracking mechanism, they should face south direction for better output throughout the year. 3 Shading Even a small part of shaded panel, affects the entire output of the panels to a great extent. Ensure the panels are placed such that there is no shadow on them throughout the day. Even a single partially shaded panel affects the output of all other solar panels in the system. Also, ensure that there is no dust etc on the panel to avoid shading. 4 Temperature Higher the temperature, lower will be the output from solar panels. Usually, panels are rated according to standard test conditions (i.e temperature: 25 degree Celsius, insolation 1000W/m2, Air Mass: 1.5). Hence, if temperature is higher than this, your panels may give less than rated output. Now, let us understand how quality of solar pv panels can be determined by looking at their datasheet. We request the readers to ask for the datasheet of the panels they wish to buy and verify the following factors. A solar panel rated at say 100 Watts should give at least 100 Watts under standard test conditions. 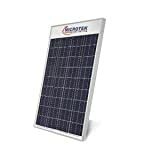 However, if the manufacturers say that their panels have a tolerance of +/- 5%, it means the same panel can give either 105 Watts (acceptable) or even 95 Watts (not acceptable). Ensure that your solar panel will always have ‘positive tolerance’ mentioned on the datasheet. As mentioned above, temperature affects the output of solar panels. As temperature increases from 25 degree Celsius: current increases, voltage decreases, power decreases. And vice versa. Now the extent to which this increase/decrease takes place is given in terms of temperature co-efficient as percentage change per degree of temperature change (eg. Power change = -0.04%/degree Celsius). Hence if temperature is say 40 degree Celsius, then rise in temperature from 25 degree Celsius is 15 degree Celsius. Hence, power will decrease by 15*0.04% i.e. 0.6% from its rated power. Lower the value of this temperature co-efficient, better stability the panel will give under different operating conditions. If this energy falls for 5 hours, then this panel will produce 210*5= 1050 Wh or 1.05kWh in a day. Higher the efficiency, higher will be amount of energy generated per unit area. So efficiency matters if you have limited space for solar panel installation and in such a case it is better to go for higher efficiency solar panel. Approvals and Certification are very important as they ensure that the solar panels meet a minimum amount of performance and safety conditions. This factor is very important as it will clearly eliminate low quality products from the lot. For highly corrosive atmosphere (coastal regions etc) the panels must qualify Salt Mist Corrosion Testing as per IEC 61701/ IS 61701. Kindly ask your supplier to present these test certificates and also check the validity of these certificates. If the quality is genuine, it won’t be difficult to get these certificates. 80% of the rated output for next ten years. This obviously varies from manufacture to manufacture or product to product. Some manufacturers also give linear performance guarantee, which is even better. It is always preferable to check the warranty and also the terms and conditions for the same, since you won’t like the system to fail and bear the subsequent losses. It is true that the above factors can be known by only looking at the datasheet. However, there are certain factors, which you can test while purchasing the solar panels. They are Voc– Open Circuit Voltage and Isc– Short Circuit Current (click on this link to read more about these concepts: Solar Glossary – photovoltaic, panels, modules, cells, voltage, watt and current). The manufactures/ suppliers may possibly write exaggerated values of current and voltage to sell their products. However, it is always a good idea to practically check whether these values match actual output and ensure that you buy the appropriate panel. All you need is a good multimeter. Please note, that you do this under some safety precaution or get it done by some qualified person. Also note that while connecting and disconnecting the wires, the solar panel has to be shaded (like shown in the video). Having said that, we would like to mention that this article aims to compare only the quality of solar pv panels. Kindly note that the size of the panel you select and how you install it, also affects the output of the system. We will surely cover these factors as well in subsequent articles on designing and installation. We hope that this article helps you to identify and compare the quality of solar panels based on a few basic concepts.